John and Sherry Petersik over at Young House Love came to Toronto, the only book tour location in Canada! No way was I going to be just over 2 hours away from them and not meet them! I've been following their blog for 2 years now and was super psyched to see them in person. Luckily Michael was off work a willing participant in making my goal obsession come to fruition. We made a day of it, stopping at Vaughan Mills to shop at a mall, then dropped in to see his sister Deina and her two girls in Mississauga. Then off to meet the Petersiks! It was exactly what I envisioned....500+ women, 25-35 years old, some that also drug their husbands (and some babies), all there to wait in a 2+ hour line to meet Sherry who they think their best friends with. Luckily I set myself up for reality instead of the dream to sit down with them and ask penetrating questions over a cup of tea while Sherry oogles over my daughter and we bond over likeness in personality and love for DIY. It was worth the wait, though it wasn't until 9pm that we finally got up to the table. 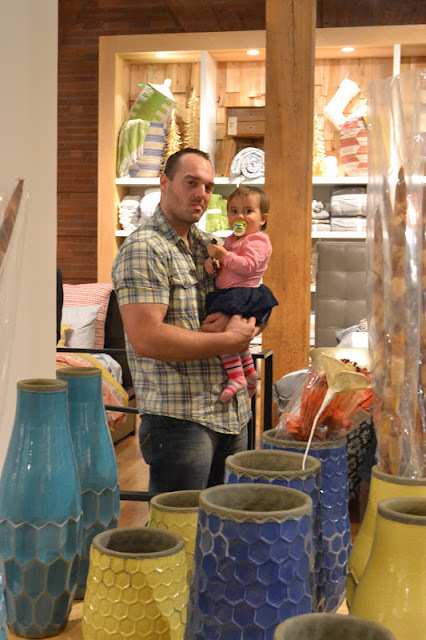 It gave me lots of time to shop West Elm, which is where the book signing was held. Win win! I saved up in anticipation for the trip to go crazy shopping, which is exactly what I did. I just love that store! This picture doesn't do justice to the packed-ness of the West Elm. The line was wrapped around the back of the store. My troopers. Michael's face looks about how he felt! haha. He really was a great sport and Paisley was unbelievable. Most of the time this girl loses her mind when she's tired, but there was so much stimulation and people that she kept it together fairly well. Paisley trying out one of the trays for size. I'm almost there! Sherry had to jet to the little girls room, leaving John alone for a tad. Yay! I finally got to meet my pseudo best friends, haha! Sherry signed the owl I snagged while I was there. It was almost a cliche I told them at that point b/c I'm pretty sure a lot of people are doing that at the book signing as Sherry loves white ceramic animals. On top of meeting them, as an added bonus, I met Jen over at Rambling Renovators! I recognized her as she was signing John and Sherry's guest book. She took off before I had a chance to snap a pic with her. Bummer. It was so neat to be in the world of fellow DIY lovers. Even with the 2+ hour drive home I think I stayed up until midnight delving into their book. SO many great ideas. With all that they do in their own home I don't know how they came up with 243 MORE projects to write about!